Imagine that you can just talk with your software, instead of navigating through screens, windows, clicking and typing; you have more time for your patients, rather than spending time with your computer screen. This is what ezCDS helps you do. 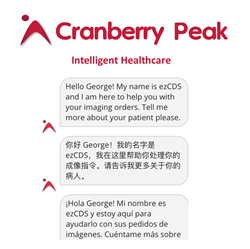 Cranberry Peak, a leading company in AI and conversational interfaces technology for healthcare, is announcing an agreement with Siemens Healthineers. Its product, ezCDS will be available in the Siemens Healthineers Digital Ecosystem and presented at the annual HiMMS conference in Las Vegas March 5-9, 2018.
ezCDS is a CMS qualified clinical decision support mechanism for the Appropriate Use Criteria Program, supporting implementation of the PAMA and MACRA mandates. Specifically, ordering physicians will be required to consult a product like ezCDS prior to ordering an advanced diagnostic imaging service. A cause of increasing cost of healthcare and one of the main causes of physicians’ dissatisfaction is the administrative burden. ezCDS is addressing both administrative burden and these CMS requirements, by introducing a patent pending AI assistant serving as a clinical decision support mechanism. With voice, multiple languages and conversational interface, ezCDS makes compliance easy and offers an outstanding user experience. “Imagine that you can just talk with your software, instead of navigating through screens, windows, clicking and typing; you have more time for your patients, rather than spending time with your computer screen. This is what ezCDS helps you do,” said Neculai Archip, PhD, MBA, the Founder and CEO of Cranberry Peak. “Both Siemens Healthineers and Cranberry Peak share a passion for innovation and technology to help healthcare providers deliver the best possible care for their patients. We are changing the way healthcare professionals interact with their software, and the partnership with Siemens Healthineers is a fantastic opportunity for us to impact healthcare and society,” Dr. Archip goes on to say. ezCDS is a cloud- and web browser-based software that can be used both stand alone and integrated with most EMR/RIS systems. With a modern architecture and practical AI, it offers users a glimpse to the future of software in healthcare. The open and secured environment of the Digital Ecosystem from Siemens Healthineers is the right venue to provide innovative products like ezCDS. It effectively integrates and interconnects data and knowledge from a global and diverse network of healthcare stakeholders. “The spectrum of members' data, capabilities, digital offerings and access points to the Digital Ecosystem keeps growing and allows healthcare providers worldwide to harness the power of healthcare going digital. We will generate unprecedented insights through our own offerings as well as through innovative digital health partners like Cranberry Peak. The goal is to help customers using data to deliver value based care with better outcomes at lower costs. We are very excited to welcome Cranberry Peak to our Digital Ecosystem,” said Alexander Lippert, Head of Digital Ecosystem at Siemens Healthineers. The Digital Ecosystem from Siemens Healthineers provides an open and secured environment for digitalizing healthcare. It effectively integrates and interconnects data and knowledge from a global and diverse network of healthcare stakeholders. Digital offerings developed by members of the Siemens Healthineers Digital Ecosystem will help to increase decision making capabilities based on data-driven insights. A dedicated store for digital offerings from Siemens Healthineers and as well its partners will allow users to quickly assess the different offerings and the use cases they serve. It supports healthcare institutions to efficiently purchase and deploy digital health offerings within their setting.